Why write? 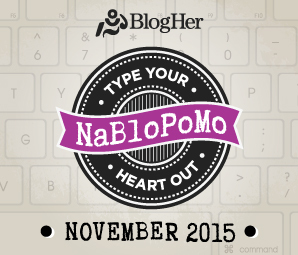 Why do I write and why do I write a daily blog post during NaBloPoMo? Well, writing has been a reliable, heart-opening and challenging experience for me all my life. It has provided a place where I could express my thoughts and feelings when there was no one to speak to. For many years, my words have been mostly private attempts to capture a sensation, idea or experience. I’ve partaken of some workshops, classes and writing groups now and then, but for the most part I’ve kept my writing to myself. As I got older, and honestly, as I came to care less and less what other people thought about me (which had been a youthful preoccupation, not unusual) my writing began to shift, in content and in level of privacy. The benefits of getting things written down without mincing words, without holding back at all, are seductive. “If it’s bad, so what, I tried.” And with the dramatic shifts in the publishing world, it became easier to remember that always focusing on publication is no way to write. I have spent about 35 years working with other writers, working hard as a coach, teacher and editor. I still enjoy working with writers of all stripes, but as time ahead no longer appears infinite, its time to focus on what I want to write. As I dig deeper and unearth unspoken truths, it is as if I am removing boulders from a path. Once I have removed an obstacle, there is no question about moving forward, I just do. The relief and release (and relaxation!) that writing out my history, my angst and my joys is monumental. Giving myself a chance to freely express thoughts and feelings is no small thing. Okay, I’ll say it: It is healing. And what I have learned from reading blogs on the Internet and concentrating my book reading on memoirs, is that publicly sharing one’s truths can occasionally have an effect on others. I have been the recipient of so many ‘Aha’ moments while reading the work of others; that has been the richest part of my inner life, all my life. The very first year that I participated in NaBloPoMo, catapulted me into a new arena. Speaking aloud, online, not only didn’t kill me, but there were two or three people who found words in the posts that meant something to them. That is more than enough encouragement to keep writing and posting, one month a year. As I have said before, it is hard work and I continue to be in awe of bloggers who post daily. But I am proud to be in the kindergarten of the blog-o-sphere. If I never graduate to first grade, that’s okay. I have plenty of work to do here: digging in the sandbox, making things from clay and taking naps. This entry was posted in Creativity, Writing and tagged aging, NaBloPoMo 2015, writing by Assembling a Cooking Life. Bookmark the permalink.